These resources have been created and peer-reviewed by scientist members of the American Society of Agronomy. 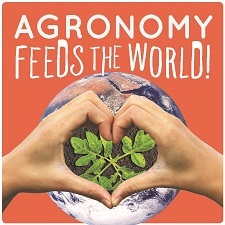 Agronomy Feeds the World- Check out these modules from ASA to use in the classroom! A special thanks goes out to PlantingScience for developing these materials for ASA. Agronomy @ Work - Watch these videos to learn what agronomists do! Agronomists are plant and soil scientists who work with farmers, companies, and others in the agriculture community to implement the latest methods and tools for growing crops profitably and sustainably. Agronomy Grow With It! Lesson Plans - A full activity packet has been designed specifically for this site for educators with lessons and hands-on activities related to agronomy and agriculture. Agronomy 4 Me- Printable Catcher - Students can learn fun facts about agronomy while creating and playing with this "cootie catcher". Bioenergy Lab Activities - These lab activities, developed by a scientist member of ASA, explore the role of yeast in the production of ethanol and explain how biofuels are produced. Geared toward middle and upper level classrooms. Biofuels Overview – Want to learn more about biofuels? This overview, developed by the Soil Science Society of America in 2010, provides information on just what biofuels are. Celery Activity - Use this activity guide to conduct an experiment and observe the location of xylem tissue within the stalk of celery. Expand the concept to discuss nutrient and water movement in a variety of plants! Circles of the Earth Activity - Circles of the Earth bracelets provide a unique lesson for younger students to learn about life interactions on our planet. Inexpensive materials can be purchased at most craft stores. Environmental Effects of Bioenergy Feedstocks - In this matching game, participants will track carbon throughout the lifecycle of cellulosic ethanol; from growing switchgrass to conversion to the use of fuel. Ideal for high school chemistry classes! State Soil Booklets - Interactive map features soil booklets, developed and written by soil scientists to provide in-depth information on each state soil. While the following sites are not officially endorsed (with the exception of the Soils4Teachers site), they have a variety of materials and activities at different grade levels. Our scientists have reviewed and approved all of these materials containing accurate, scientific information before posting on our page. Soils4Teachers.org - The Soil Science Society of America has developed this K-12 educator’s website and features lessons/activities, resources, definitions, links and a matrix of seven subject-matter areas categorized by grades K-4, 5-8, and 9-12 and vetted by soil scientists. National Agriculture in the Classroom – Search this Curriculum Matrix by grade level, content area, common core connections, state specific content, or literacy outcomes. SARE Learning Center - High school research project? Look no further for sustainable agriculture information. SARE's searchable database can help track down materials, educational guides, research, and more! Nutrients for Life – Modules are available for elementary, middle and high school classrooms and provide STEM activities and lessons to show how the challenge of feeding our world’s growing population can be solved with science. National Farm to School Network – Farm to School aims to bring food and agriculture education into schools and early care settings. NFSN offers a searchable resource database for traditional and non-traditional education settings. Little Red Hen - In this Ag in the Classroom activity for K-2, students will read the story, “The Little Red Hen,” discuss all the different careers involved in producing a loaf of bread, and act out a play based on the story. Students will sprout wheat seeds. My Farm Web - K-5 Students will learn to relate goods and services to resources within the community by building a web that traces products back to the farm. Courtesy of Utah Ag in the Classroom. Classroom Activities in Plant Science - 8 lessons for grades 4-6 about plant science from Oklahoma Extension and 4-H that covers everything from parts of a plant to producing them for food. My American Farm - Fun online games for K-5 – for both the classroom and families. Brought to you by the American Farm Bureau Foundation for Agriculture. The Great Plant Escape – University of Illinois Extension for grades 4-5 - Each of the lessons in this program is interdisciplinary, designed to introduce students to plant science and increase their understanding of how foods grow. A teacher’s guide is also available. Illuminating Photosynthesis - This Nova page describes the mechanics of photosynthesis while engaging students with three puzzlers and answers about photosynthesis. Great resource for grades 5-8. Science in your Shopping Cart: High Tech Food - This NAITC lesson plan for grades 6-8 introduces the high-tech aspects of agricultural production and explores the related careers. Serious Cereal Science - In this National Ag in the Classroom activity for grades 6-8, students will develop an appreciation for the extensive materials and career fields provided by agriculture, specifically as related to cereal grain production, processing, and consumption. What Makes Plants Grow? - The Institute of Food and Agricultural Sciences offers this adaptable curriculum package for grades 6-8 including learning objectives, lessons, activities, and reflection questions. Your Food, Farm to Table – This 3- minute YouTube video from International Food Information Council Foundation uses fun infographics to demonstrate how much has changed since farming began- for the farmer and the consumer! Ideal for grades 6-12. "Bringing Biotechnology to Life" is a resource for science educators and others interested in learning more about biotechnology and its role in food production. This unit of instruction addresses national learning standards for 7th – 10th grade, yet the interest level may be much broader. Purple Plow is a special project brought to you by the American Farm Bureau Foundation for Agriculture (AFBFA) for middle school and high school. The challenge encourages students to research scenarios related to food, hunger and sustainability and build their own prototypes to solve the defined problem. Resources provided for facilitators, students and volunteers are written by teachers, aligned to national learning standards and reviewed by industry experts. Fields of Fuel Computer Game - In this game, players—both students and the public—take on the role of farmers working to sustainably grow crops to produce energy resources, earn income and improve ecosystem services. View this video to learn more about how using a video game (like Fields of Fuel) to support reasoning about sustainability. Seed Germination Demonstration and Plant Biology Discussion - This interactive experiment will guide students to analyze what is necessary for seeds to germinate! Earth’s Interconnected Systems: Nitrogen – For the high-school level, this activity uses a qualitative nitrate test to observe results of some conversions and transformations in the nitrogen cycle. This activity was developed by the Soil Science Society of America. Farm to School – Institute for Agriculture and Trade Policy has developed this Youth Leadership Curriculum targeted toward 11th and 12th grade. Explore the instructor guide, lesson plans, standard alignment, worksheets, and more. The Science of Farming - In this story, students follow the investigations of GLBRC agronomists, who design large-scale biofuel crop experiments on farms. Students learn about the unique challenges and interesting discoveries that come from conducting experiments in the field. Science of Agriculture - Short animations, interactives, and videos teach math and science concepts crucial to the study of agriculture. Provided by New Mexico State University Learning Games Lab. 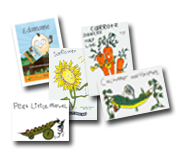 We have seeds available for you! Just contact us at membership@sciencesocieties.org with your name and address and the number of packets you would like. Don't worry, we don't put your name in any database or use it to contact you after sending the seeds. Note to teachers - if you are interested in larger quantities, please ask. Order stickers for your classroom as well! Create a home or school garden with the Junior Master Gardeners program! Have a suggestion for an activity or site that should be included here? Send feedback to Susan Chapman at ASA.